Living in Asia, we have the ability to see so many sites that are right at our door step. The opportunity to go to India for under $1,000 with flights, hotel, and tours was a deal I could not pass up. I went in May, which is low season, and why the deal was so hot (literally and figuratively); the temps peaked at 117 degrees there, but the cold water and A/C made it worth it. I went with three other women and it was an amazing time. The theory is to not smile or make eye contact with men and you will be safe. I would advise DO NOT take public transit if you are a woman traveler in India. 3-star in India is far lower than 3-star in the states, meaning it is like a road side motel. However, the price is right. Hotels do not have hot water, and most hotels have the shower, toilet and sink in one area. Pack toilet paper (lots of it); TP is hard to come by in many places in India as people there tend to spray their underparts clean. The season to get sick in India is monsoon season which runs June to September. This time of the year it rains a lot and food is harder to transport, so many things get ruined and are still served. I avoided the “Delhi Belly,” as they call it, by taking a Pepto daily for precautionary measures, eating lots of bread and NO dairy. Just do not go crazy and eat off the street vendors and you will survive. India is cheap in a sense, but the places you will eat will be 5-star standards, so you are fine. Do not drink the water, but ensure you stay hydrated for the tours. Pickpocketing is the worst in Agra and Jaipur, so keep your belongings close. As far as clothes, you can see in the picture (above) we dressed modestly and covered our shoulders and knees at all times. Many times I thought it was still not enough in most temples. This did not include tips for guides or driver. The standard is $5 per person per day. The driver is with you the whole time and for 5 days a $100- $150 tip is the norm. Also extras such as elephant rides, temple fees and camera fees are right at $70 a person. We flew China Eastern from Okinawa to Shanghai and then to Delhi, the same in reverse coming home. The flights were $422 a person. We booked in February for a May departure. The visa must be done at least 60 days out as it takes time. IACE in the Schilling Community Center was able to take care of it. The cost was $250-280 each. Day 1: Arrival-Delhi – Arrival at Delhi airport and pickup by representative, then proceed to hotel. Later city tour of New Delhi & Old Delhi covering Birla Temple, India Gate, PM House, Lotus Temple, Humayuns Tomb, Red Fort, Qutab Minar, Gandhi Memorial, Jama Masjid, and Chandni Chowk (by walk or Cycle Riksha), one of the main oldest markets of the Delhi. Overnight stay at hotel. Day 2: Delhi-Sikandra-Agra- 205 km – After breakfast proceed to Agra. On the way visit Sikandra, the mausoleum of Great Mughal Emperor Akbar. On arrival at Agra check into hotel. Later city tour of Agra visiting Taj Mahal, the symbol of love,Agra Fort and Tomb of It-Mad-Ud-Daulah. Overnight stay at hotel. Day 3: Agra –Fatehpursikri-Jaipur- 235 km – After breakfast proceed to Jaipur. On the way visit Fatehpur Sikri – Akbar old capital city. Visit Shrine of Sheikh Salim Chisti, Palace of Jodha Bai, Panch Mahal and various attractions, then continue drive to Jaipur. On arrival at Jaipur check into hotel. Evening visit to Chokhi-Dhani (an ethnic resort) to enjoy rajasthani food, cultural program, and folk dance. Overnight stay at hotel. Day 4: Jaipur-Delhi- Tour Completed – After breakfast proceed for excursion to Amber Fort in the outskirts of Jaipur. Elephant ride ascent to the Fort. Amber Fort is the classic romantic rajasthani fort palace. Its construction was started by Man Singh I in1592. 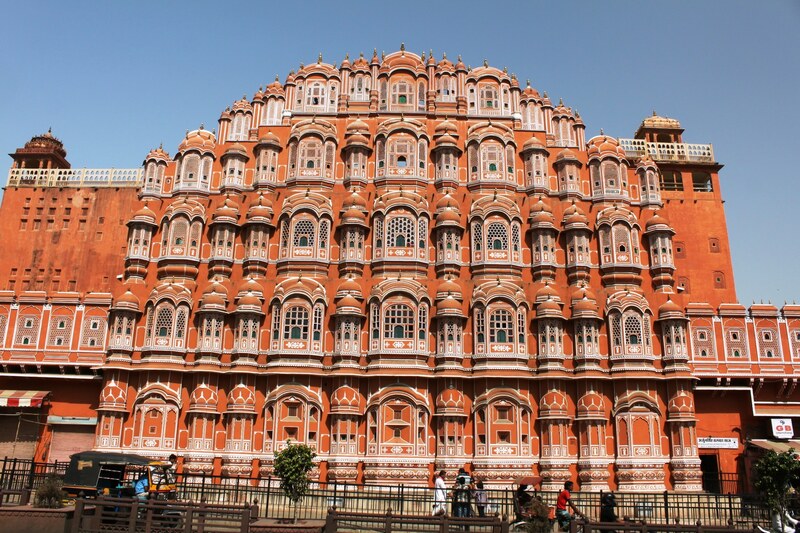 Later visit Water Palace, Royal Palace Museum, Observatory, Hawa Mahal, Albert Hall and Birla Temple. Return to Delhi. On arrival at Delhi, dinner and then transfer to airport for return flight. We booked all the local stuff through the agency below. They have solid reviews on Trip Advisor and our experience was enough to know we made the right choice. My biggest recommendation is to get the flight from Jaipur to Delhi the last day. The roads are non-existent on that route home and two of the girls were feeling car sick from the bumpy adventure. All in all it was an amazing trip and a MUST do. The food, people and the culture was something that will last a lifetime in memories.